My article will not, of course, entirely answer this question; that, to my mind, is the collective endeavor of this conference. Nor will it address black art collaboratives or black art collectives per se. Instead, “Taking It to the Streets” addresses Caribbean, African American, and more widely African diasporic cultural practices and their artistic corollaries that create collective representation, indeed, collectivities of and for the African diaspora. In fact, this essay highlights individual artists, or at least artists who have been credited as such, but whose practices have been concerned with, or in some instances created, black collectivities. Finally, what is the purpose of the collective if not representation? What is the purpose of collective representation if not collective action serving the purposes and intents of the collectivity? And how has this been achieved historically if not through mass action? It is against this backdrop that I am interested in current forms of mass gathering within contemporary African diasporic artistic practices even as their political goals might even as their political goals might not seem immediately obvious and might no longer seem necessary given the context that I previously highlighted: the increasing recognition, mainstreaming, and marketability of black art and culture. But surely these artists’ works address issues that go beyond their own immediate artistic interests to embrace broader societal concerns. If there is a genealogy of African diasporic public ceremonial culture to be written, New Orleans and Harlem would be its starting and ending, spatial and temporal, cultural and ideological points, with Chicago and Houston and a few other historical centers of the Great Migration in between. 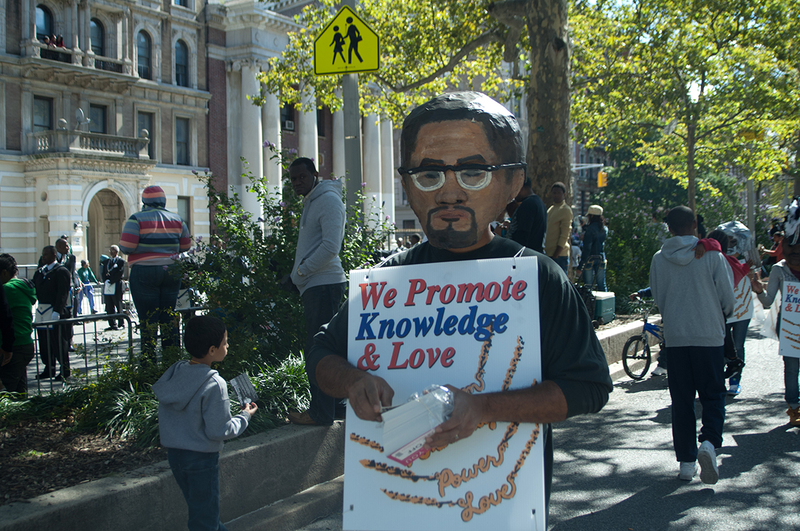 Shani Peters, We Promote Knowledge and Love: Parade Day in Harlem, photo still, 2011. Street performance during the Forty-Second African American Day Parade, Harlem, New York, September 18, 2011. Courtesy the artist. © Shani Peters 2011. Harlem has always been at the forefront of a rich movement culture. The Civil Rights Movement is the most widely known product of this culture. Much less widely known is Harlem’s distinct public ceremonial culture, which once comprised not just political demonstrations, but also military marches, funeral processions, and carnival parades to entertain, educate, protest, pray, mourn and celebrate, in silence and in music, in anger, sorrow and joy. In 1927, the funeral procession of African-American entertainer Florence Mills, the Blackbird, drew crowds in unprecedented numbers to the streets of Harlem (up to 150,000, according to some estimates) to commemorate her brief but stellar career. Coming out of the commingling of Southern blacks from the Great Migration and immigrants from the West Indies within the turmoil of the last century’s historical struggles, Harlem’s forms of public address have antecedents in the artistic manifestations of Africa and its diasporic cultures in the Caribbean, Latin America, and the American South. Throughout the 1920s, Marcus Garvey organized elaborate pageants to provide propagandistic visual rhetoric to the UNIA, the largest black mass movement in America. Adam Clayton Powell Jr., former Pastor of the famed Abyssinian Baptist Church and a fallen Civil Rights leader, had understood the commonality of these practices beyond their seemingly different functions and goals. Powell organized many marches, strikes, picket lines and boycotts, and was a notorious parade participant, crossing over Caribbean and African American processional traditions: he gave the first parade permit to the Harlem Carnival in 1947 and became the first grand marshal of the African American Day Parade in 1969. He famously declared that mass action is the most powerful force on earth. Photographers such as James Van Der Zee and Klytus Smith took shots every step along the way, just as Harlem Renaissance and other writers cast these memories in words, creating some of the most iconic mementos of Harlem. By the mid-twentieth century, the parade had become Harlem’s distinctive diasporic idiom – West Indian, Latin American, African American – and one that spoke of an African aesthetics and politics born anew in Upper Manhattan. 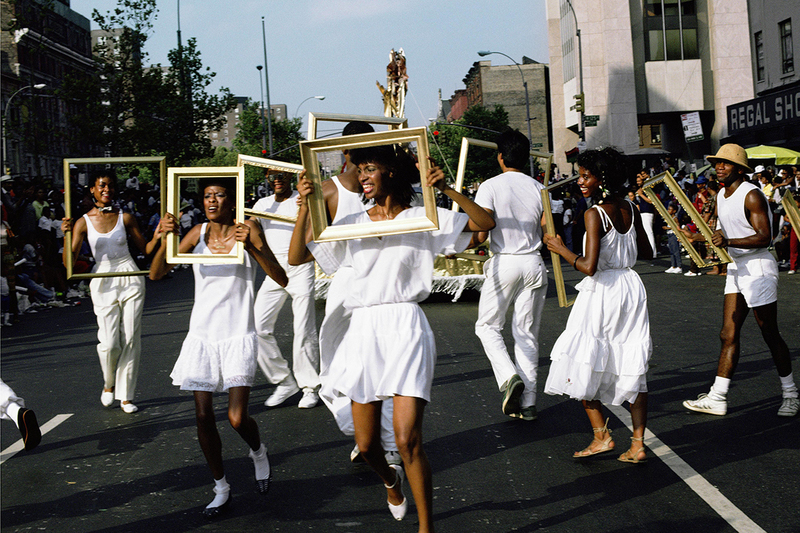 Art Is…, Lorraine O’Grady’s public processional performance at Harlem’s 1983 African-American Day parade (Fig.1), might be the best introduction to this practice, which asserts the aesthetic value and subjective agency of the African-American community. The series of small empty gilded frames—held by hired dancers in white leotards who walked alongside a monumental frame carried on a flatbed truck turned float—formed moving tableaux vivants whose motifs and subjects moved out of the frame and into the streets, where they were reframed as worthy of artistic interest, indeed, as worthy as the art itself. Shani Peters’s 2011 performance of iconic African-American anti-slavery and civil rights figures in We Promote Love and Knowledge also took place during the African American Day Parade (Fig.2). Participants wearing papier-mâché heads of Harriet Tubman, Frederick Douglass, Marcus Garvey, Martin Luther King Jr., and Malcolm X distributed flyers with quotes from the latter. Much as O’Grady’s Harlem performance was inspired by Brooklyn’s West Indian American Day Parade—whose origins lay in the Harlem Carnival of the late 1940s and the 1950s7—Peters’s project looked to street hawkers advertising the pawnbrokers in Harlem, Brooklyn, and other low-income communities. Both O’Grady and Peters found in the parade and other street traditions, whether processional or not, the vehicle for alternative display models rooted in the African diasporic tradition. 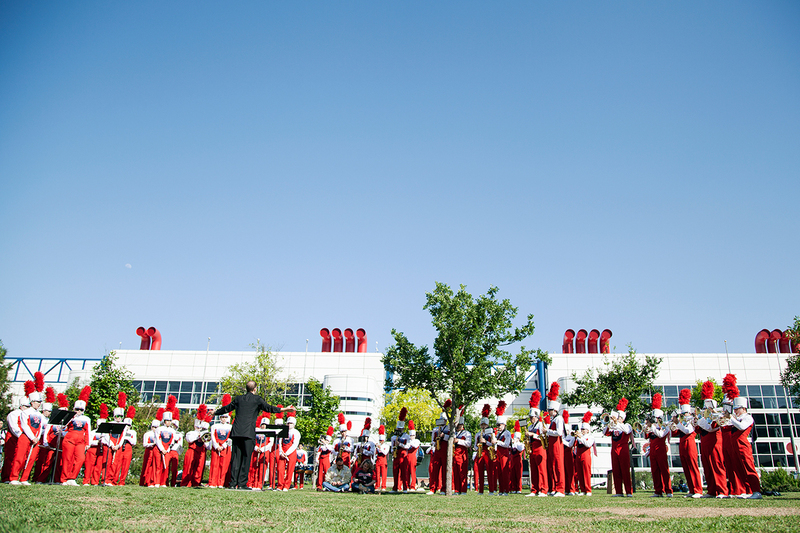 Other such traditions, which often overlap and are constantly updated to incorporate contemporary trends, include the marching band tradition. The Chicago-based artist and filmmaker Cauleen Smith has been taken up this tradition, mixed it with the flash mob fad, and layered it with Sun Ra’s Arkestral acoustics (Fig.3).8 More recently, the musician Daniel Bernard Roumain mixed things up further in Houston by creating what was advertised as “a cross between a flash mob, a pep rally, a processional and a pop-up recital” for En Masse Studies & Etudes, a “deconstructed parade” powered by Haitian and African American contrapuntal musical styles such as kompa and soul music (Fig.4).9 The centerpiece of Smith’s interventions has been the Solar Flare Arkestral Marching Band; Roumain performed with the University of Houston’s Spirit of Houston Marching Band. A project organized by Sol Sax, Masqueraders are the Ancestors of Protestors, encompasses the ethos of many African American public shows of strength, which have sometimes been misunderstood as mindless entertainment when they do not display an overtly political agenda. Designed to celebrate Juneteeth, the celebration of the liberation of the last American slaves in Texas, Sax’s yearly jubilee was co-organized this year with fellow artists Saya Woolfalk and Firelei Báez. The latter looked to New Orleans, that other bookend for the African American performance tradition, to which New Orleans-native Rashaad Newsome paid homage in the second-line-inspired performance that accompanies his King of Arms solo show at the New Orleans Museum of Art (Fig. 5). Rashaad Newsome, King of Arms (2013), video still, recorded second-line performance for the exhibition King of Arms, New Orleans Museum of Art, June 21-September 15, 2013. Courtesy Rashaad Newsome Studio. © Rashaad Newsome 2013. In closing, I would like to offer a more definitive conclusion than this otherwise cursory introduction, in keeping with my longstanding critique of Eurocentric genealogies of performance art, and following Frank Guridy’s assertion about the importance of performance in understanding “diasporic linkages among people of African descent across national, cultural, and linguistic borders”.10 If we are to further twist the question from forming black collectivities to performing black collectivities, and to think about black performance practices, then my essay shows that the reemergence of the mass public processional performance charts a history of performance to be found not in the European avant-garde of the beginning of the last century but in the experience of slavery and colonialism, of independence struggles and civil rights movements. As mass demonstrations continue to shake the nation and as some ponder whether Trayvon Martin might be this century’s Emmett Till, the lessons learned from this historical tradition continue to provide guidance. Freestyle, Studio Museum in Harlem (2001); Fore, Studio Museum in Harlem (2012-2013). David Scott, “On the Very Idea of a Black Radical Tradition,” Small Axe no. 40 (2013): 1. 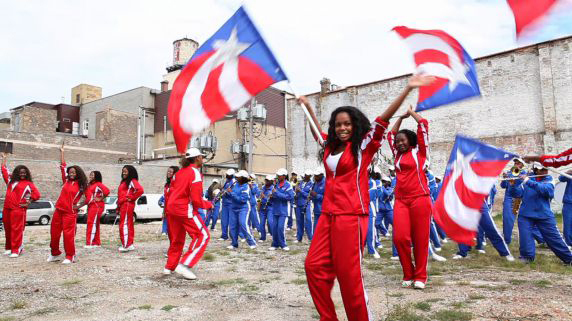 About the Carnival tradition, watch out for En Mas’: Carnival 21st Century Style, a traveling performance and exhibition project curated by Claire Tancons in collaboration with Krista Thompson slated to premiere at CAC New Orleans in Fall 2015.